Now I am trying to optimize the shape of canopy with maximum volumn, but the galapagos stopped at the specific point every time. 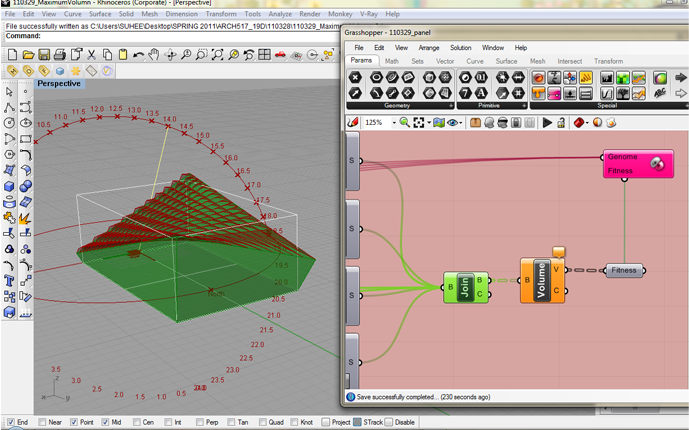 I attached the Rhino and Grasshopper file. Please take a look and give me the solution. Thanks! The red screen usually indicates a failure with the graphics card driver (OpenGL). I would recommend that you run the system the panels disabled to take some load off your graphics card. Enable the panels after Galapagos has found the correct surface. Let me know if this resolves your problem!